A big story thus far in 2018 has been U.S. small-cap stocks, which have emerged as one of the best performing major asset classes. Normally this would come as a surprise so late in the economic cycle, but this year is different. 2018 may well produce the fastest economic growth the country has seen in the last 10 years. It’s also been a year when threats by the Trump administration have morphed into actual tariffs on imports. In this environment, it makes sense that small caps should outperform large-company stocks, as they typically are more insulated from a rising dollar and the complexity of global supply chains. But what has driven small-cap performance? And will current valuations give investors pause before putting new money to work? The answers may depend on which barometer one uses to evaluate the small-cap segment. In the first six months of 2018, the Russell 2000 Index, for example, outpaced the S&P 500 Index by roughly 500 basis points (bps), returning 7.7%. When this happens, it’s always good to drill down into one of the largest sectors in the Russell 2000, health care, and examine how the biotech stocks performed. For much of the year, biotech, one of the most speculative portions of the small-cap universe, represented 7% to 9% of the weight of the Russell 2000 and was a major contributor to overall returns. Small-cap biotechs, as measured by the Russell 2000 Biotech Index, returned 13.5% through June. If small-cap biotechs continue to outperform, the Russell 2000 Index may be a difficult benchmark to beat, because many of these constituents are “story stocks” trading on hopes of future growth. If we drill down into those health care and biotech companies, we notice that roughly 62% of them generate no profits, so betting on the Russell 2000 requires that investors assume this embedded speculative bet. For those looking for an alternative, WisdomTree believes you can increase quality and reduce valuation risk by limiting your small-cap exposure to only companies that generated profits in the prior fiscal year. WisdomTree created an Index that does this. The WisdomTree U.S. SmallCap Earnings Index, which actually beat the Russell 2000, returning 7.9% through the first half of the year. Yet, it did so without relying on small-cap biotechs to lead the advance. On June 30, the WisdomTree Index was 7.5 percentage points under-weight health care compared to the Russell 2000, and it concentrated just 1.3% of its weight in biotech companies. Put another way, during a six-month span when companies with very high price-to-earnings (P/E) ratios or negative earnings posted some of the highest returns in the small-cap space, the WisdomTree index still outperformed this “beta” benchmark, even though it tilted index weights toward lower P/E stocks. This table, derived from WisdomTree’s index attribution tool available on our website, illustrates this point. The table shows that during the first half of the year, 21.57% of the Russell 2000’s weight was in companies that posted losses (Negative Earners). Yet, as a category, those stocks returned 14.08% year-to-date through June 30. 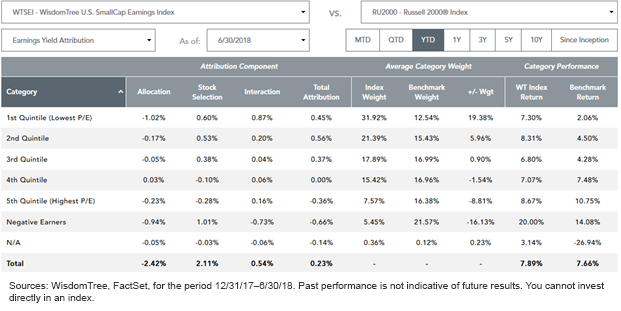 WisdomTree’s Index, weighted by core earnings, had about 5% of its weight in constituents that either became unprofitable during this period or had negative noncore earnings, and so was roughly 15 percentage points under-weight the best performing category for this period. By contrast, WisdomTree was nearly 20 percentage points over-weight the stocks with the lowest P/E ratios. As a category, this group of stocks returned 7.30% for WisdomTree—generally in line with the market—but significantly better than the cheapest stocks in the Russell 2000, which on average returned only 2% for the period. In fact, by being over-weight the two quintiles with the lowest P/E stocks, the WisdomTree Index generated 100 bps of excess return compared to the Russell 2000, more than making up for the 66 bps drag in performance by being under-weight the Negative Earners. Our research has shown that over longer holding periods, investors actually get a greater reward by tilting toward profitable companies and away from the speculative small caps that have no profits. So being permanently under-weight the Negative Earners is an “embedded bet” we believe investors should be systemically making in the small-cap segment. Avoiding them also helps lower the overall P/E ratio on the Index. On June 30, for example, the Russell 2000 was trading at 25 times forward earnings, whereas the WisdomTree U.S. SmallCap Earnings Index exhibited a forward P/E of 14.5. Perhaps most importantly for investors, earnings weighting this starting universe of profitable small-cap companies has the potential to create alpha compared to traditional cap-weighted indexes. As we can see from this table, even after deducting for Fund fees and expenses, the WisdomTree U.S. SmallCap Earnings Fund (EES) which tracks the WisdomTree U.S. SmallCap Earnings Index, has consistently outperformed both the Russell 2000 Index and its peer group. It has done so over not just the last year, but over the last three years, the last five years and the last 10 years. Over the 10-year time frame, it has generated returns that have surpassed the Russell 2000 by approximately 300 bps on an annualized basis. If we include mutual funds, the excess return of EES over its category stretched to 400 bps per year. That ranked EES in the top 1% of the Small Blend Category monitored by Morningstar over that period. And all this from an index fund! All data as of June 30, 2018, and sourced from WisdomTree, FactSet.